step-by-step tree-view chart for answers about copyright law. No notice is requied on the single copy of an artwork. Where many copies lacked notice, it is as if there were no notice. Correction for lack of copyright notice on a small number of copies was allowed by law, but could be exercised only where 1) a small number of copies had lacked notice, and 2) efforts were made to correct the omission. In the case of a work dated 1978 to March 1989, the efforts had to occur within five years. If publication took place without copyright notice yet without the publication having been authorized by the work’s owner, the rightful copyright owner cannot be penalized for actions involving an unauthorized appropriation of his property. He can be deprived of rights only on the basis of a publication of actions and failures of himself, his licensees and his agents. The previous page of this web site shows examples of defective copyright notices — notices which in many cases are as bad as there being no notices. It would be futile to have a page of illustrations of works on which there were no notices, because a substantial number of pages of a book, or film frames of a movie, or angles of an artwork, would have to be shown on this page to express the point to a reader of this web page that no copyright notice appears on the work in a place where a person would reasonably expect to find it. Imagine if this page showed a frame from every different credits screen of the opening credits of a movie, just to make the point that nowhere on any of these screens is there a copyright notice! However, it is important that a copyright notice be where a person would expect to find it, according to the law. Copyright notices in places where a reader wouldn’t expect to find it — such as page 51 of a periodical — have been ruled invalid; see the page of court decisions on copyright notice placement on this web site. This page displays five images of the copyright information page of a single work. Each image was photographed from a different copy of the book. The book enjoys copyright protection, and has done so since publication, yet the publisher came to have this protection only after defaulting on steps that would have been the easiest to follow to place copyright notice in each copy of the book. The photos on this page illustrate the evidence of what amounts to an “11th Hour Save” of a copyright. Readers who want to know what courts have decided should read the summaries of court decisions on this web site for the cases of Scandia House Enterprise Inc. v. Dam Things Establishment and P. Kaufman, Inc. v. Rex Curtain Corp., et al. Rand’s death in March 1982 affected her last planned book not merely in shifting the responsibility for article selections upon her heir. Her death led also to the ownership of her copyrights being transferred to her heir. Articles that had always borne her name as copyright claimant might now bear her name, the name of heir Leonard Peikoff, or the name of her Estate. The choice of the new claimant need not have been made hurriedly. 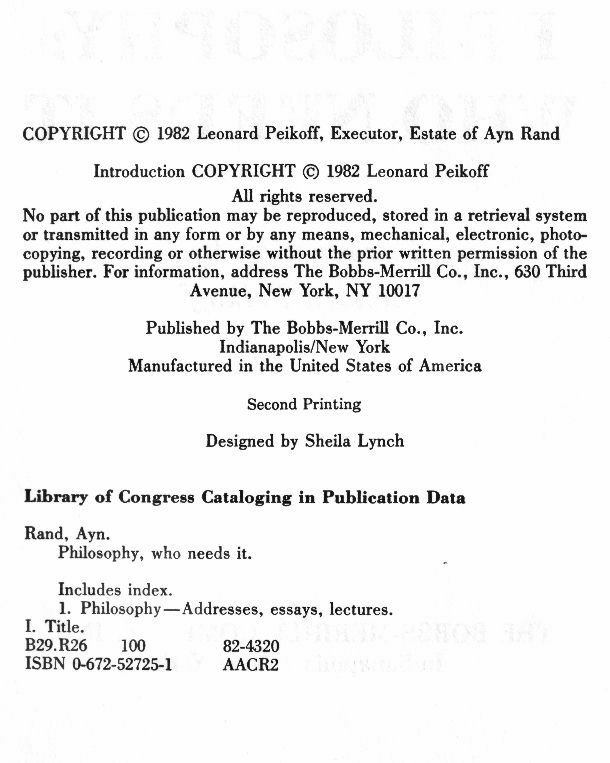 Between Rand’s death and publication of the new book would lay the several months during which: 1) Dr. Peikoff made the final selection of articles and the order in which they would appear; 2) the manuscript was prepared for submission to the publisher; 3) the manuscript was worked on by the publisher; 4) galleys were provided by the publisher to the author (or heir, in this case) to be proofread; 5) typographical errors were corrected by the publisher and checked against instructions. 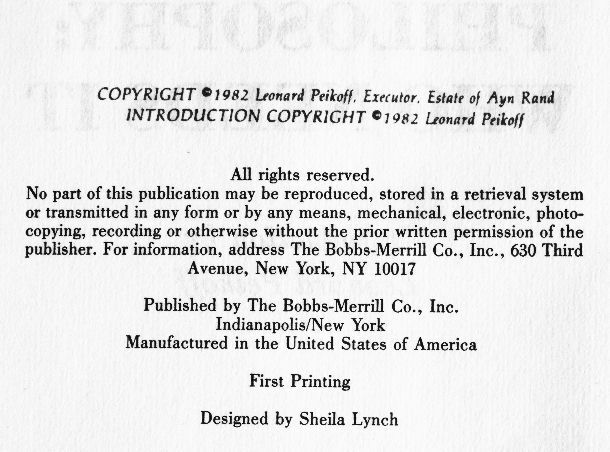 At any of these points in time, personnel working for the publisher might have noticed that the copyright information on the back of the title page was incomplete and that specific wording would have to be obtained from the author’s heir or representatives. Alternatively, during these months, the heir or a representative of the author could have provided this information, with or without prompting to do so. As evident from the above illustration and the two that immediately follow, each copy of the first batch of copies of Philosophy: Who Needs It to be shipped to book stores had the copyright notice in a slightly different place on the copyright information page. On the above illustration, the left-most part of the copyright notice intrudes into the margin; the whole notice is lopsided; and an ink smear is at just below the lower right edge of the notice. Although the photographic quality of the images on this page don’t show the fine gradations of black hues, it is apparent from looking at the books themselves that the copyright notices were stamped into each copy using a rubber stamp, impressing the notice into place with a type of ink that is a lighter shade of black than the ink used to print the pages which had been produced using conventional, high-speed, plate-based printing methods. The ink stain at the lower right of the notice appears to have been left when a corner of the rubber stamp caught on the paper and made contact with the page when the rubber stamp was lifted or was descending to impress the notice. The notice is straighter and better centered on this copy than on the above one. More evidence of a rubber stamp having been used: smearing. The word “copyright” on the top line has “ghost” arcs inside the letters. On the second line, what should be straight lines instead sway within the word “copyright” and the number “1982”. The second printing. The error corrected on the publisher’s master, the book from now on has the copyright information printed properly. Had the 11th-hour save not taken place, the majority of Philosophy: Who Needs It would have nonetheless been protected by copyright, owing to its being an anthology of previously-copyrighted works. Copyright for most of the book would have circuitiously been in effect owing to “underlying rights.” (See the illustrations page on derivative versions and the court decisions summaries page on underlying copyright, both in this web site.) Underlying copyrights would protect the compilation even if the copyright in the compilation were faulty. Only the copyright in the “material added” to the “preexisting material” would be jeopardized by faulty copyright of the new work. The anthology book Philosophy: Who Needs It consists primarily of speeches and articles written over the course of about fifteen years, with each piece having first been offered to the public as early as 1960 or as late as 1975. Separate copyrights cover the various pieces. These copyrights will expire at different times, based on the start date of each separate copyright, and even a 1975 copyright can be expected to expire seven years earlier than the 1982 copyright taken on the book as a whole. Even so, a 1960 copyright properly undertaken and renewed will result in a copyright which will last (under present laws) until 2055; 1975 copyrights will last until 2070, and the 1982 copyright on the book will last until 2077. Even were there not a copyright on the anthology (and the fact is to the contrary of this supposition), its “new” contents will enjoy separate copyright until as late as 2070. When 2070 has come and gone and the separate pieces are no longer under copyright, it will be legal for parties other than the copyright holder to reprint these separate parts separately, yet even then the contents cannot be combined and sequenced in the same order as in Philosophy: Who Needs It until that book too has gone into the public domain, because the specific creative choices made for the book will continue to enjoy its separate copyright protection for a few years beyond that of the youngest selection. In the case of Philosophy: Who Needs It, the anthology enjoys separate copyright protection for: 1) its selection and sequence; 2) its new explanatory footnotes and explanatory comments; and 3) the introduction written specifically for the book. These are the things (and the only things) that would have been denied copyright had protection been lost for lack of proper notice. 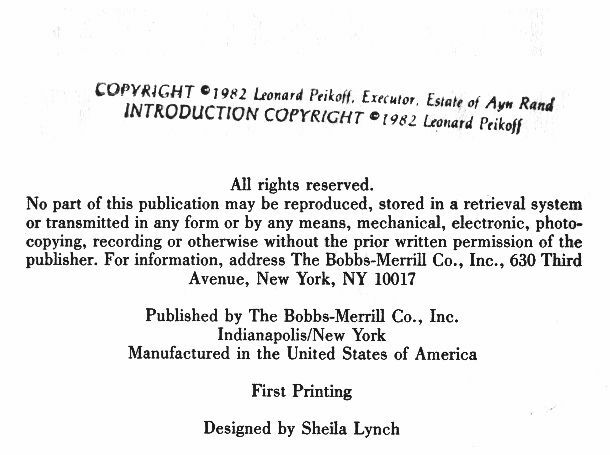 Readers who look at the above pictures should take notice that Leonard Peikoff claimed copyright in the introduction under his own name, which is proper given that Peikoff completed it through his own efforts after Ayn Rand’s death. 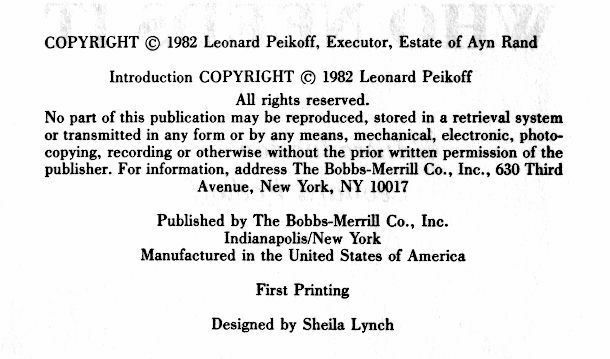 Peikoff’s separate copyright for his introduction amounts to an explicit declaration as to what is the most substantive new material (as against pre-existing material, new arrangements, or brief new explanation) in the book as a whole. Some readers might ask: “If every part of the above book enjoys the maximum form of copyright, why is it that the proprietor of this web site — someone obviously well-versed in the penalties of violating copyright law — reproduces images and quotations from it right here on a web site devoted to reporting on how strong copyright protection can be?” The answer is that brief quotations are permitted by fair use. (See the section on this web site about fair use.) 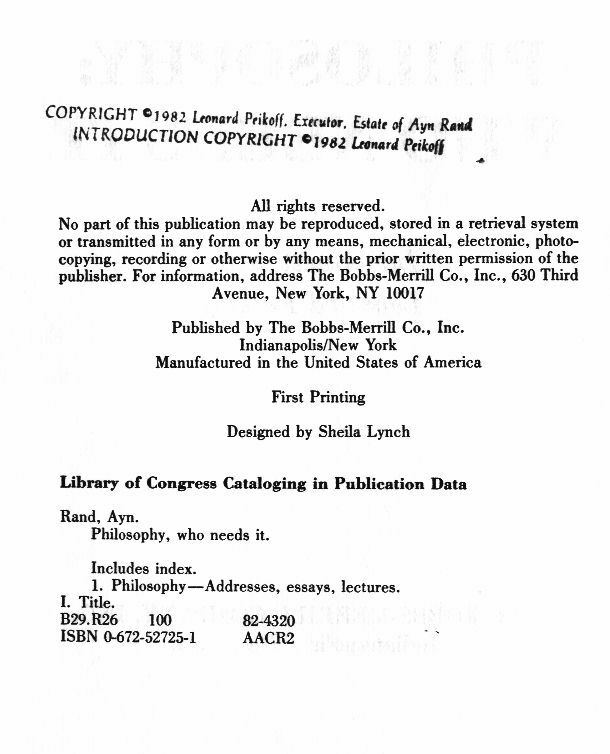 The propriety of this web site reproducing the copyright information page of Philosophy: Who Needs It (which is the page of the book that the present web page reproduces as it appears in five different copies of the book) involves an additional aspect of copyright law: copyright covers creativity and originality, not the standardized and deliberately-unoriginal combinations of terms assembled in formulaic manner for something like a copyright notice. (To read more about the requirement under copyright law that there be originality, see the page on this web site for originality. Of particular importance is the Supreme Court decision in Feist Publications, Inc. v. Rural Tel. Service Co., which is summarized on another page of this web site.) All of the wording on the copyright notice (excepting specific claimant names and the publisher address) is identical to that on untold thousands of other copyright notices in thousands of books. Thus, the copyright notice is not in itself entitled to copyright protection. and read what the courts decided. All hyper-links mid-page other than those that take you to a location elsewhere on this page, will open in a new window. No links within the main body of this page will load entirely new content within this window. You don’t have to fear losing your place within this page.